We loved working with Brittney! From theoment we first contacted Brittney, she was great to work with - responsive, friendly and professional. We had an engagement photo shoot with her before the wedding. We absolutely loved how the pictures turned out, but also loved spending the afternoon with her and getting to know her better before the wedding. She put us at ease in front of the camera. The same was true on our wedding day. She was easy and fun to have around and ended up taking fabulous pictures that really captured the best memonets of our wedding. Would highly recommend Brittney!! Twice hired – Twice Blown Away! This was the second family wedding where we used Brittney. She photographed my daughter’s wedding last November and we were totally blown away by her work. So, when I got engaged, the first vendor I hired was Brittney! She is all the things you want in a photographer -- professional, great eye for a photo, timely, courteous, fun yet discreet. However, here is where Brittney EXCELS. She has the gift of being able to capture the day’s events, the guests, and the venue perfectly and uniquely to your day. When I compare my photos with my daughter’s, despite common pictures (first look, wedding party, ceremony, etc.) and common guests, the perspectives of the photos are totally different. I am in awe of how she memorialized our events so beautifully. I think this is because Brittney does not overly pose her subjects. She lets things flow and as a result, the photos are a true recording of how your special day looked and how your guests (and you) felt. Even your wedding party pictures will look more like someone captured a great time versus someone posed you to take a photo. She is simply awesome. The only problem you will have in hiring Brittney is choosing which photos to put on social media, send to family/friends, and to put on your walls because each shot will be fabulous!! Our experience with Brittney Raine for our wedding was wonderful. Leading up to the wedding she replies very quick and keeps you in the loop with timeline on the day and only a couple days after the wedding she sent "sneak peak" pictures of our wedding which we didn't expect! On the wedding day itself we felt like we've known Brittney for years. She provided a very calming presence which we needed but at the same time took charge and made sure we got all those beautiful shots. Brittney made our experience effortlessly easy and natural. If I could give her 10 stars I would! Brittney was hands down the BEST decision we made during our 1.5 year engagement! She was one of the first vendors we hired and surpassed every expectation we ever had in a wedding photographer. When doing our research, Brittney described her style as “storytelling”, “emotional” and “candid”. It was our first time working with a professional photographer so it was hard to imagine how that would translate for us, but we liked the sound of it, the look of her very impressive portfolio and she was just SO NICE - so we confidently decided to move forward. It’s safe to say that we’ve been absolutely blown away every step of the way. Brittney is all the standard things you’d expect in a photographer (professional, organized, punctual, etc.) and so much more. When you’re with Brittney you feel as though you’re hanging out with a long-time friend instead of a strange person following you around all day. We definitely don’t consider ourselves comfortable in front of the camera, but the more time you spend with Brittney the more you realize how invested she is in you and your story that you never feel like another subject. Brittney is the best. I wish I could leave it at that because nothing else I write seems to do her justice. Her work is exceptional. I've ordered countless prints ... and keep finding new favorites every time I look through our photos. Brittney melted seamlessly into the setting and somehow managed to capture every single encounter and emotion. Her photos truly come to life. But beyond that, Brittney was an amazing presence on our wedding day. She brings the perfect balance of calm, insight, and humor, and I loved spending time with her. This is the only vendor review I am leaving—not because we're unhappy with the others, but because I truly believe in only recommending the very best. And that is Brittney. Our friends recommended Brittney Raine to us almost immediately after we got engaged, and I am so thankful that they did. We could not have asked for a better experience with her, she surpassed every expectation we ever had in a wedding photographer. She completely captured “us” in our engagement session as well as on the wedding day. Every smirk, head thrown back laugh, ugly cry, goofy smile was forever caught by her camera, and we are unbelievably grateful. She encouraged us to feel our feelings and I’m so glad she did. We were on our honeymoon when she sent us a few sample photos, those photos had us in tears at a dive bar within seconds. And when we received all the wedding photos, it was like reliving the entire day over again. And not just by remembering what things looked like, but by beautifully capturing the emotions of all our friends and family throughout the day. There’s no way we could ever choose just one favorite photo, each photo is perfect. Brittney went above and beyond in every way, in her professionalism, in her amazing work, but most importantly, in her kindness. Where do I even begin?! I could rave about Brittney all day long because she is hands down INCREDIBLE! I am a huge over-thinker and choosing vendors for our June 2018 wedding was very overwhelming. I knew that photos were something I did not want to skimp on, because after all, when everything is over, photos are the one thing that is left and allows you to relive your special day. Having Brittney photograph both our engagement session and our wedding day was one of the best decisions we made during the entire wedding planning process. After we first met her, we instantly knew she was the one - no thinking necessary (which for me is unheard of!). Brittney has a way of making you feel as though you are reconnecting with an old friend, which I found to be one of her most prized traits when behind the lens. During our entire 12 years together, my husband and I are not a very sappy PDA couple, so I was nervous what it was going to be like in front of the camera. During our engagement shoot and on our wedding day, boy did we feel comfortable around her, which allowed us to shine and her to snapshot our love and personalities in the most authentic way. She does not force poses or make you feel like you time traveled to your senior prom photo days; rather, she really focuses on candidly showing your relationship through her lens in the least obnoxious or intrusive way. When we received our photos, I could not stop tearing up. I am in LOVE with them and how much they encompass myself and my husband (and our family and four-legged child)! She did a phenomenal job documenting our day and all of the emotions that stemmed from it - I didn't even realize she was there for many of the moments! Lastly, from start to finish, Brittney was beyond organized, on top of things and responsive, even providing great suggestions for other vendors when I was as usual, overthinking things. Brittney, we cannot thank you enough! You're lucky I am out of character space - YOU'RE THE BEST! Brittney is an incredible talent and lovely person. We could not recommend her more highly or enthusiastically. We had our engagement and wedding photos with her and were thrilled with how they turned out. She is incredibly kind, accommodating, and easy to work with. Brittney has the unique ability to find nuance in her subjects and capture people in such an honest way. From detail shots, to candids, to larger group and posed shots, the range in Brittney’s style really comes through and all of the events she photographs. She’s able to make the unique aspects of each wedding shine. On our wedding day, she was organized, punctual, scouted beautiful locations for our portraits beforehand, and ran a tight ship – we finished our requested friends/family portraits with time to spare before the ceremony and were able to get extra shots in. She was so stealth throughout the evening, too. We don’t know how she managed to take all the photos she did – it’s as if she cloned herself. People look so comfortable in her photos – none of the rigidity that you often see in wedding photos, especially those that are posed. She’s so creative -- The perspectives of the photos are beautiful – some were so artistic, we loved her black and whites, and each image felt so special. It’s clear she puts a huge amount of thought and work into selecting and editing the images. Brittney is exceptional. It was such a pleasure getting to know her. We’ll treasure her photos for the rest of our lives and we’re so grateful to her. There are no words sufficient to describe how wonderful it was to work with Brittney. From the day we booked her to our wedding two weeks ago, she handled every detail with care and consideration. While she remained incredibly professional throughout, she ultimately felt like a close friend by our wedding day. Our photos are natural, genuine, and beautiful and we've been asked countless times who our photographer was. If you are thinking of hiring Brittney, all I can say is yes, don't wait, do it now. I can't believe she even has openings in her schedule. Anyone would be lucky to have her. I've been slow in writing this review because my husband and I want to make sure to do Brittney justice. We had the BEST experience working with her. We had a fairly laid back wedding but the one aspect we really wanted to make sure we got right was the photographer. We had a relatively nontraditional wedding (restaurant location, no bridal parties, only 50ish people etc.) so needed to find someone who would be willing to break out of the "typical" photos and just capture the emotions of the day. From the beginning, we knew Brittney was perfect - she was even willing to shorten the typical day since we didn't really need to begin photos until 3pm. She was always quick to respond to all emails and even made a few vendor recommendations to us when we were in need of help. We didn't meet in person until the day of our wedding but it could not have gone smoother. We were so comfortable around her and I recently commented to a friend that while I was getting ready with just my sisters and my mom, I don't even remember Brittney being in the room with us - a testament to how stealthy she was, which really allowed her to capture all of the real moments. During portraits, we felt like we were spending time with an old friend and never felt like we were being forced into awkward positions that didn't feel true to us. Her top priority was clearly always trying to get photos that captured emotion and would transport us back to that day - and she certainly did just that. Looking back on our wedding, the best planning decision we made was investing in Brittney. We could not recommend her more highly to anyone who wants to make sure their photos are authentic, honest, and full of love. Thank you Brittney! We can and will rave about Brittney for as long as anyone is willing to listen! You can get a good sense of her style as an artist, and whether that fits with your wedding, from her online portfolio. What you won’t get is a sense of is what it’s like to actually work with Brittney. So, let me tell you! Working with Brittney was such an enjoyable experience for two main reasons. First, she’s everything you’d look for in a professional: reliable, responsive, accommodating, and willing to field any and all questions about her work. Second, she really listened to our concerns and worked with us to get the best photos from the wedding. Although both of us are introverts who dislike having our photo taken, all our concerns went away after the first five minutes of our engagement shoot. Brittney has an incredible talent for reading people: she knew how to put us at ease, when to make suggestions, and when to back off and let us do our own thing. Going into the wedding, it didn’t even occur to me to be worried about the photography, that’s how much trust and confidence I had in Brittney. And during the day, she kept us feeling calm and comfortable, capturing all the moments we’d asked for in an unobtrusive way. We were so excited to get the photos back, and love how she captured the feel and emotion of our wedding. We are so grateful to Brittney for producing such beautiful shots, and would recommend her a million times over! How does one begin to describe finding someone who has captured the day you have been looking forward to your whole life so perfectly and most beautifully. Brittney was amazing from the get-go. Her responsiveness, her availability, her style was just completely on point with everything we had hoped and searched for. We started out with a different photographer, but found Brittney and absolutely loved her. We eloped about five hours away from Philadelphia and she took the trek with no problem and followed through with every single thing we wanted captured. From helping us get ready, making us laugh throughout portraits, and loving on our dogs as her own, she was so awesome to work with. We look at all of our photos from that day every.single.week and I.still.cry. Brittney, thank you. Thank you so much for walking through the wilderness to get the best shot, thank you for our beautiful photos of our first dance in our family's wheat field, thank you for a lifetime of reliving the best day of our lives. My now husband and I met Brittney in person for the first time the day of our wedding -- you're probably thinking this bride is nuts, but we knew from the moment that we first spoke with her over the phone that she was going to capture our wedding day JUST how we wanted her to. And she more than delivered. She is so talented at capturing the feelings and emotions of the day through photos, and that is something that we can't ever thank her enough for. She takes the type of photos that make you want to cry [in the best way possible because you miss those moments and the day so much] and she is the kind of professional who is able to make you relive that day minute by minute through the images. If you are looking for a one of a kind, personable, professional photographer who is willing to go above and beyond for you to capture your day in the BEST light -- you need to book Brittney now. It was the best decision my husband and I could have made and we are so happy we did. 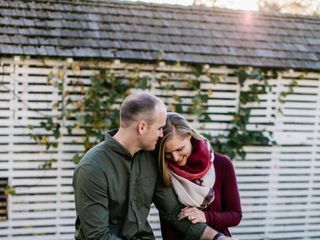 Brittney took engagement and wedding photos for us, and we've been gushing about her ever since! First off, she is an absolute joy to work with. Both me and my husband are quite camera-shy, but she was so great at putting us at ease. We were both surprised at how much FUN we have when we are being photographed by her. She's also an amazing artist with such a great eye. Some of my favorite photos from our wedding our brilliant candids that she and her second shooter caught of us and our guests. In short, Brittney is a master at what she does and we can't recommend her enough!! Brittney was one of the best decisions that we made for our wedding last September. First of all, she is a really great person and extremely talented photographer. Brittney was responsive, professional, and caring throughout our whole process - from the moment we initially reached out to her until the final photos came in. She was definitely our favorite person that we worked with for our wedding. Brittney was totally on board with our slightly nontraditional wedding and made us feel comfortable the whole time throughout the day. She was really able to capture all the little moments, the mood, the emotions, and the details of the day with her incredible photos. Her attention to detail in her photos really stands out and is truly something special. We will definitely cherish her photos and they have received raving compliments from all that have seen them. Britney is so relaxed, confident, funny, and understanding and made us feel so much more at ease. We felt like she really understood our style and really helped us to be comfortable on our wedding. She has a knack for details not just in her photos, but even little things like providing umbrellas when the weather turned rainy the morning of our wedding and worked around the showers. Seriously, everyone: she’s the absolute best. Her photography is amazing and she’s beyond professional and fun to be around. So, thank you Brittney, you made our wedding so memorable. While searching for a photographer, I came across a stunning photo of a bride and groom at a campsite, and felt immediately transported to these strangers’ wedding day. The non-traditional view, the vibrant colors, and the rawness of the photo captivated me! It was truly a piece of artwork, and I immediately knew I had to find the photographer who took it. To our luck, Brittney Raine Photography was located right in Philly. A few months later we took an impromptu trip into the city and reached out to Brittney to meet her. 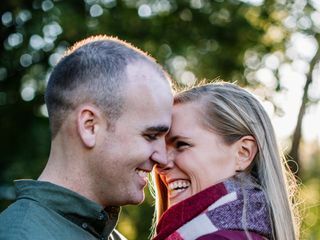 She was quick to accommodate our last minute request, and from the moment we met Brittney, we knew we had to book her for our February wedding. Not only is she a true artist behind the camera, but also she is extremely easy to get along with and made our wedding day totally stress-free. She showed up early, and immediately started shooting. She made us feel so calm and comfortable in front of the camera -We honestly felt like we had known her for years! Brittney and her associate photographer were true professionals. I am still in awe of our wedding photos. They encompass every beautiful and unique quality of the original photo of hers I fell in love with, and her talent and creativity shine through with every image. Brittney, not only have you made time stand still for us, but we know twenty years from now the pictures you have taken will make us laugh, cry, and take us right back to those emotional moments from our wedding day. THANK YOU! Hands down booking Brittney was one of the best decisions we made in planning our wedding. Right off the bat, I was so impressed with her speedy responsiveness and professionalism. From our first conversation, I felt that Brittney cared deeply about creating memories that reflected our vision of our wedding day. She eagerly agreed to travel to the other side of the country for us for our big day. Our engagement shoot with her in Philadelphia helped us become comfortable with her and with having our photo taken. She even got some great shots of our uncooperative pup! Throughout the year of wedding planning, she was completely on the ball, checking in with us at regular intervals to see if she could be of any assistance. She made sure to arrive at our snowy destination several days early, so I wasn't worried about her making it to our celebration. 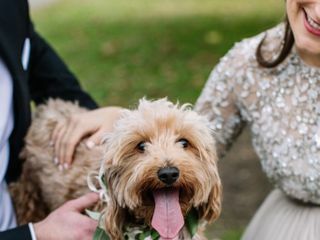 On the wedding day itself, Brittney's presence was absolutely invaluable -- she reassured and calmed me throughout the whirlwind leading up to the ceremony, even whipping out ginger chews to help my nerves whenever I looked like I needed them. She captured the most incredible shots of our day without ever intruding in our special moments. The photos from our day not only arrived promptly when she promised them, but are also so rich, vibrant, emotional, and stunning. 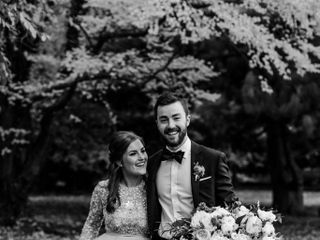 Multiple friends and family members have told us that they are hands-down the best wedding photos they've ever seen - and we couldn't agree more! We will cherish our photos and our time spent with Brittney forever! We cannot recommend her services highly enough and are sure every couple would be as grateful and thrilled with their choice in her as photographer as we were. Everyone has a camera these days, but few know how to use it in a way to make their pictures soar and come alive. Brittney is one of those few people, and I am still in disbelief that I was able to book her for our wedding. We planned our wedding in a matter of a few short weeks. I feared that I would have to compromise quality for availability because of this, especially when looking for a photographer. Brittney was recommended to me by a mutual friend and after looking into her work, I was certain she would be above my budget and beyond my reach with my small time frame. Regardless, I went on a limb and reached out to Brittney. She got back to me within a matter of hours, eager to work with us and enthusiastic about our vision for the shoot location at a greenhouse and ceremony at my childhood home. Flexible and sweeter than sugar, she made it so easy to plan time and meeting places, even organizing a "first look" photo at the very last minute. Brittney stayed longer than anticipated in order to capture group shots and was accommodating on cost despite any inconvenience it may have caused her. She is the absolute picture of professionalism. Brittney and her work are downright sensational. I cannot overstate how thrilled I am with our photos, and how stress-free booking photography with Brittney is. Getting married in New Jersey is tough on the budget, so I was pretty discouraged after looking at the photography options available. AND THEN I FOUND BRITTNEY. . . If she had delivered even half of the amazing photos that we received back from our wedding day, it would have been totally worth it. I mention budget first because it is so immediately obvious from her portfolio and website that her work is artistic, beautiful, and natural. Additionally, she has that knack for capturing exactly how everything went down, just in the most breathtaking way possible! My husband and I are by no means adept at posing for photos (I think every picture of us in the past 5 years until the actual wedding day was just standing next to each other), but Brittney gave us just enough direction to make us feel at natural, which really let our personalities shine through the pictures. I was nervous about how the bride and groom pictures would be -- Pinterest and Facebook are chock full of couples in strange, unnatural poses that leave you wondering why a couple would ever find themselves in a field sniffing each others' necks -- but Brittney's photos of us are my favorites. She captured so many wonderful moments I never would have remembered otherwise! My main struggle is trying to narrow down the hundreds of beautiful photos into a socially acceptable number to hang up in our apartment. It was a little over a year ago that my now husband reached out to Brittney hoping she was available to shoot our Oct 1 wedding. We had seen some of BR’s work and ev-er-y-thing was right up our alley. We met with her and hit it off. My husband and I could not be happier with our wedding pictures! Brittney was very accommodating, attentive, well organized & punctual. We were debating whether or not to have a videographer & I'm glad we decided not to as Brittney was able to capture every moment of our special day just the way we remembered it. I would recommend her again & again! Brittney Raine is spectacular. She is an incredibly talented photographer that has a beautiful way of capturing authentic moments and emotion. She has a creative mind and, what was even more noteworthy to us, a true “come as you are” mentality that can seem elusive in wedding vendors. 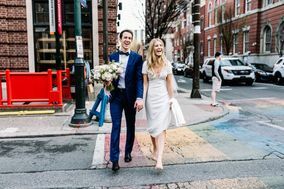 She took the time to understand how we envisioned our day – from the itinerary, to our aesthetic and overall vibe – and then proposed a timeline for us to get what we wanted, in the time and in the way that we wanted. You’ll find that she allows your wedding day to happen, and clandestinely captures the beauty in real moments. The end result is a collection of beautiful photos that you will look through over and over again because you really feel as though you are reliving your wedding day. She’s organized & professional, and a calming, comforting presence – to us, she felt like a friend we have known our entire lives. During our engagement shoot and on our wedding day, we (not super photogenic, ‘comfortable in front of the camera’ people) felt remarkably comfortable with her. Her portfolio of work (check our her website!) speaks for itself. We have nothing but great, positive things to say about Brittney. She’s not only someone we are happy to have trusted and worked with, but someone we are grateful to have met. Finding the right photographer for our wedding was really important to me and my husband and Brittney was just what were looking for. She was such a pleasure to work with from my very first encounter with her. Throughout the whole planning process she was always very responsive which is much appreciated when you're stressed with planning a wedding! She was sooo helpful in suggesting a day of timeline and flexible when we wanted to change it more than a few times! The day of the wedding she arrived right on time and made sure that we stuck to the timeline which wasn't an issue at all despite traveling to a couple different locations throughout the day. I feel like she went above and beyond her photographer duties, even sharing her water with us during some of the formal pictures (it was a warm June day). She made us feel comfortable in front of the camera and cued us just enough but wasn't pushy or demanding. Considering we had never had professional pictures taken together, she made it so easy (and made us look really good)!She was even cool with snapping a few pictures of us with our dog right after the ceremony. Most importantly, she captured moments that we will treasure forever, from the smiles to the many tears, to the party and celebration. The photos from the best day of our lives are truly beautiful, natural, and candid. They really capture all of the emotions of the day and depict what we were feeling in those special moments you only get once! Somehow she captured these these by blending in effortlessly like a guest throughout the whole day. We never felt like there was a camera in our faces or overwhelmed which was really important to us. Our images were also delivered to us faster than anticipated which is impressive considering her crazy busy schedule. I would 100% recommend Brittney to photograph your big day! Check out her website to see the beautiful images, the photos truly speak for themselves. My now husband and I will never be able to thank Brittney enough for capturing all of the beauty of our wedding - the people, the emotions, the details, the love, the hilarity, the tears. 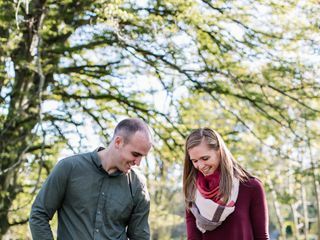 We had a total blast with her on our engagement shoot and the photos were above and beyond. My husband, who doesn't care for photos actually thanked me for choosing "someone so cool and comfortable to be around". Not to mention talented! We ended up booking Brittney to capture our rehearsal dinner as well. It it such an incredible gift for us to be able to relive our engagement and wedding through her work and we can't thank her enough for treating our wedding as if it was her own throughout the whole process. There are so many vendors out there that just treat you as a number and churn their work out - not Brittney. She takes such care and pride in all of her work, is incredibly responsive, professional and FUN to work with. By our wedding day, it was like we were just hanging out with a friend. Truly the best vendor involved in our wedding hands down. Brittney was hands-down our favorite person we worked with during our May 2016 wedding – we were so so lucky to be able to have her as our photographer. First off, her photos are just plain amazing! We always tell people our photos were the most worthwhile thing we spent money on for our wedding, because we get to keep them forever. I have an art background and enjoy photography as a hobby, so I can be pretty particular, but Brittney's artistic work really exceeded my expectations and makes me swoon. Our friends and family all gave us compliments right and left over how beautiful our wedding pictures are, and are still talking about them half a year later. 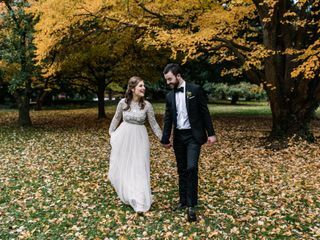 In the words of my coworker, “It looks like you stepped out of a fairytale!” And all of the photos we received were fabulous, not just a few: I tried to pick out my favorites, and I had to stop because I was picking more than half of the photos. One of the reasons we loved working with her so much is that she is just so darn fun to hang out with. I remember the week before our wedding, saying to my husband, “I’m so excited to spend time with Brittney!.” (For real, I said this.) We now consider her one of our friends! During photo sessions she is friendly and easy-going but quietly confident, has a good sense of humor, and was great at getting us to open up from the very beginning at our engagement photo session, even though we can both be a little bit shy. She also has a good balance of being able to direct you on locations and posing if you don’t know what to do, but is also open to suggestions and let us run with any ideas we had. On the practical end, Brittney was fantastic to work with. She was always organized and easy to get a hold of, and she was always prompt or early with getting our photos back to us. The web interface she uses for the photos is super easy to use as well – we loved being able to download photos easily and share with our friends and family. Thanks, Brittney, you're the best!